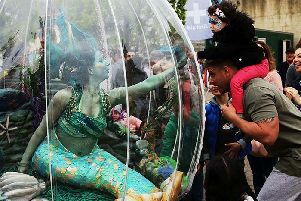 This year’s month-long Coastal Currents Arts Festival in Hastings enjoyed a fantastic start to a programme packed full of surprises. The fun began with a colourful procession from Hastings Pier of party-goers on decorated bikes, skateboards and roller skates led by popular local artist Beccy McCray with her Crafternoon Tea Club, dispensing ice cream. The party proper got underway at the Azur Marina. With entertainment provided by bands from other seaside towns along the coast. This was the taster for a weekend of attractions at venues throughout Hastings, StLeonards and beyond. Street art has always been a feature of Coastal Currents and this year festival director Tina Morris and her organisation Sweet and Dandy pulled out all the stops to create a brand new piece of artwork in time for Friday’s opening. Visual art is key to the festival and for the first time there is an art fair showcasing the work of 45 specially selected artists and makers, which continues at the Stade Hall until September 13. Pride of place at the Stade open space was taken by Morag Myercough’s spectacular and colourful bandstand, which stopped off at Coastal Currents en route to venues across Sussex. As ever during the first two weekends of the festival hundreds of artists are opening their doors in a series of open studios throughout Hastings, St Leonards, Bexhill and Glyne Gap, Battle, Northiam, Rye and Udimore. The studios will be open this coming weekend from 11am to 6pm both days. Theatre and stand-up comedy are on the agenda during the month, including a live performance by Doug Fishbone at the Stade Hall on September 12. There is also a film programme with Screen South bringing their Playback touring exhibition to the Shipwreck Museum throughout the month and there is a night of song, music, image and spoken word at Stade Hall this Friday (September 7) presented by the Light and Shadow Salon which has been running in London for over ten years as a meeting place for writers, artists and audience. For the full festival programme visit coastalcurrents.org.uk or pick up the 106 page brochure. Follow this column for a week by week preview of what is to come.